Hi all! Your little one will be coming along soon, and your belly needs some extra attention. You dont want to end up with stretch marks do you?? 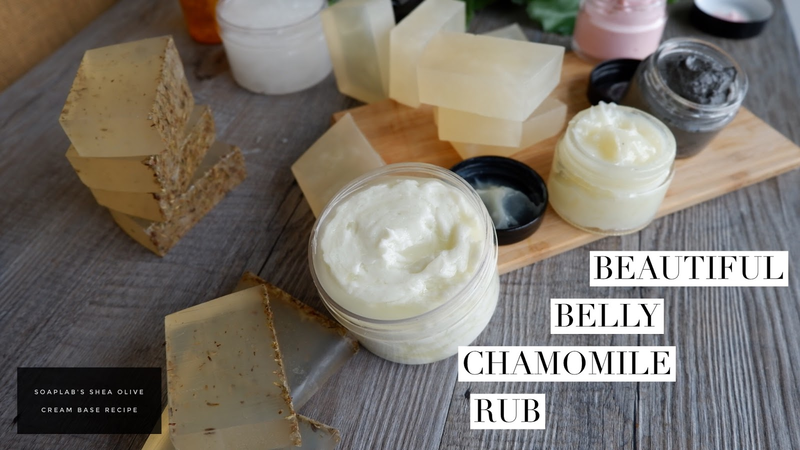 So, today's recipe will be for a beautiful belly chamomile rub. It uses a shea olive cream base, which moisturizes your skin and soothes skin irritations. Next, add Vitamin E, shea butter, rose hip oil and chamomile essential oil. Vitamin E moisturizes the skin, while reducing your stretch marks. Shea butter is extremely rich in vitamins, and is nourishing to the skin. It also reduces inflammation on the skin. Rose hip oil helps reduce the scarring of stretch marks. Finally, chamomile essential oil is a great moisturizer which also aids in the prevention of scarring on your belly. You definitely deserve the relaxation the belly rub provides. Enjoy!